Its small fin and rudder made the Spirit of St. Louis unstable and hard to fly, which was intentional to help Lindbergh stay awake. Closeup of flags on the cowling of Charles Lindbergh's Ryan NYP Spirit of St. Louis. "Our messenger of peace and goodwill has broken down another barrier of time and space." So spoke President Calvin Coolidge about Charles A. Lindbergh’s extraordinary solo transatlantic flight in 1927. Not until the Apollo 11 moon landing in 1969 was the entire world again as enthusiastic about an aviation event as it was when Lindbergh landed his little Ryan monoplane in Paris. In 1922, after a year and a half at the University of Wisconsin, Lindbergh left to study aeronautics with the Nebraska Aircraft Corporation. He was a ‘barnstormer" until 1924, when he enrolled as a flying cadet in the Army Air Service. He won his reserve commission and began serving as a civilian airmail pilot, flying the route between St. Louis and Chicago. Early in 1927 he obtained the backing of several St. Louis men to compete for the $25,000 prize offered by Raymond Orteig in 1919 for the first nonstop flight between New York City and Paris. In February of that year Lindbergh placed an order with Ryan Airlines in San Diego for an aircraft with specifications necessary to make the flight. Development began based on a standard Ryan M-2, with Donald A. Hall as principal designer. Certain modifications to the basic high-wing, strut-braced monoplane design had to be made because of the nature of the flight. The wingspan was increased by 10 feet and the structural members of the fuselage and wing cellule were redesigned to accommodate the greater fuel load. Plywood was fitted along the leading edge of the wings. The fuselage design followed that of a standard M-2 except that it was lengthened 2 feet. The cockpit was moved further to the rear for safety and the engine was moved forward for balance, thus permitting the fuel tank to be installed at the center of gravity. The pilot could see forward only by means of a periscope or by turning the aircraft to look out of a side window. A Wright Whirlwind J-5C engine supplied the power. Late in April 1927 the work on the aircraft was completed. It was painted silver and carried registration number N-X-21 1, which, with all other lettering on the plane, was painted in black. Lindbergh made several test flights, and then flew the aircraft from San Diego to New York on May 10—12, making only one stop, at St. Louis. His flight time of 21 hours, 40 minutes set a new transcontinental record. After waiting several days in New York for favorable weather, Lindbergh took off for Paris alone, on the morning of May 20, 1927. Thirty-three hours, 30 minutes, and 3,610 miles later he landed safely at Le Bourget Field, near Paris, where he was greeted by a wildly enthusiastic crowd of 100,000. Lindbergh and the Spirit of St Louis returned to the United States aboard the U.S.S. Memphis on June 11. He received tumultuous welcomes in Washington, D.C. and New York City. From July 20 until October 23 of that year he took the famous plane on a tour of the United States. Then, on December 13, he and the Spirit of St. Louis flew nonstop from Washington to Mexico City; through Central America, Colombia, Venezuela, Puerto Rico; and nonstop from Havana to St. Louis. Beginning in Mexico City, flags of the countries he visited were painted on both sides of the cowling. 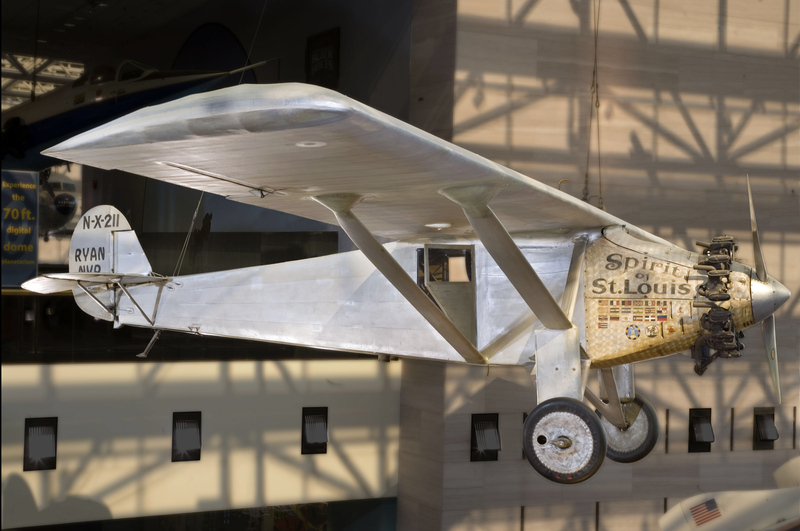 On April 30, 1928, the Spirit of St. Louis made its final flight—from St. Louis to Washington, D.C where Lindbergh presented the aircraft to the Smithsonian Institution. Black rubber tire for right side of aircraft sewn to gray colored fabric which covers metal spoke, 2 screws, 1 washer, and metal plate.